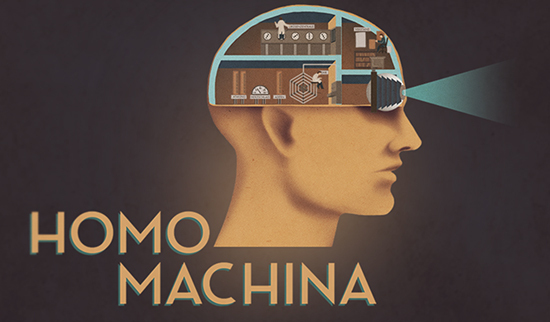 Homo Machina invites players to see inside the human body, as viewed through the unique aesthetic lens of the work of Fritz Kahn. Gameplay is straightforward and intuitive, the player instructing the on-screen staff to oversee the human body’s many and varied functions - from eating and breathing, to controlling emotions and monitoring the nervous system. The game illustrates, with charismatic artwork and animation, poetic narration and uplifting music, the beauty of Kahn's enduring imagery. Kahn, a German Jewish physician, was a master of making complex anatomical and technological concepts easier to understand. His best-selling 1920s book series, Das Leben des Menschen (Human Life), reimagined the human body as a vast machine, comprised of connected departments and communication channels, fully manned by a staff of tiny human workers. It’s this humourous and light-hearted take on homo-sapiens insides that translates into the superbly tactile gameplay of Homo Machina. Forced to leave Germany in the early 1930s, as antisemitism was on the rise, Kahn referred to the human body as “the most competent machine in the world”. His imaginative art, transforming the biological into the mechanical, has delighted viewers for almost a century and represents a foundational cornerstone of infographic design.